Jenny Wishart is an experienced virtual assistant who owns her own company Jens VA (Virtual Assistant) Services. 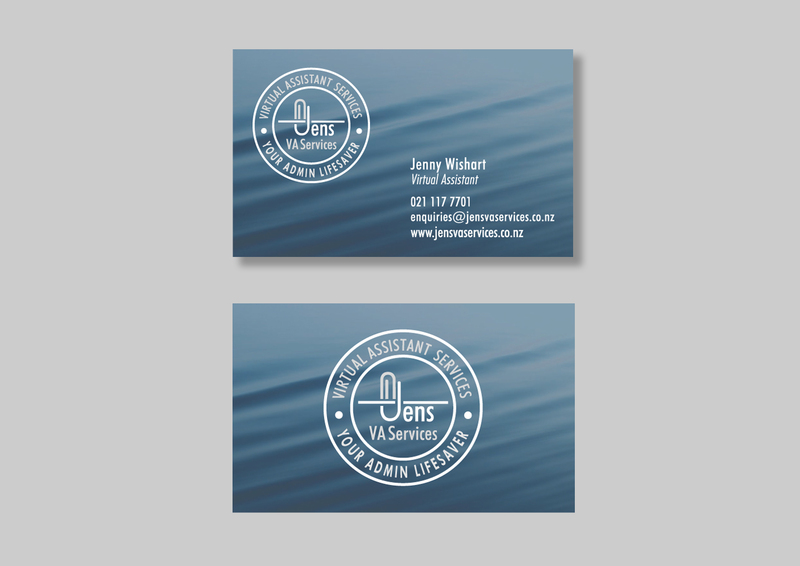 Jenny required a company brand, business stationery (business cards and letterhead) to be designed. Brief: To design a brand that stood out and visually communicated both ideas behind her brand Virtual Assistant Services and Your Admin Lifesaver. Solution: The brand is simple with a san serif font. The logo incorporated a paperclip icon that merges with the ‘J’ in Jen, this communicated the office assistant part of the idea. The business name and paperclip icon sits in the middle of a life preserver ring. The Bi-Line text ‘Virtual Assistant Services Your Admin Lifesaver runs in a circle inside the lifesaver shape. Format: Business Card, full colour printed both sides printed on a card stock and laminated both sides with a silky matt laminate. Brief: To apply the brand to the business card, and letterhead. Solution: The ‘look and feel’ was created by placing the logo on top of a beautiful blue ocean image background. The image is simple and stylish.